This past August I spent a few days in Wyoming and Montana with the Fly Shop of the Bighorns and Rock Creek Anglers fishing some incredible water. Each day we went somewhere different and I saw parts of both states that I had never been to before but will certainly be making the trip back again. If you didn't see them the first time around, you can visit the trip posts HERE, HERE, HERE, and HERE. Rock Creek Anglers has spent a lot of time developing access to quite a few amazing properties and it was great to get a glimpse of these places on two of the days while spending the other two on public water. The Tailgate Gear Review highlights of the gear pieces that made this trip work. 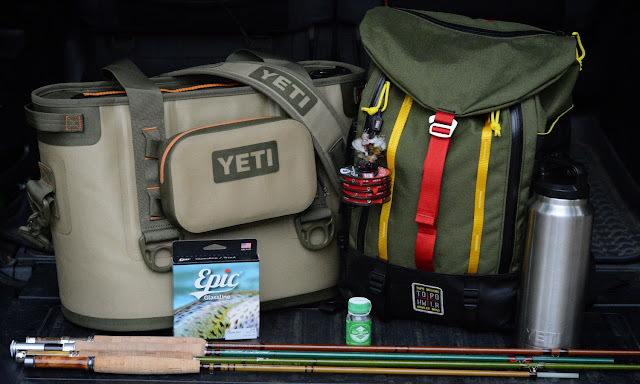 Apologizes to Korkers and C. Barclay Fly Rod Co. for not getting the boots and 75p fly rod in the above photograph. I'm still not quite sure how that happened. I've been in and out of several different Korkers wading boots over the years but the pair that I've been most impressed by far have been the Devil's Canyon. These boots are built of a rubberized synthetic material that is extremely durable but lightweight. The M2 Boa lacing system makes these wading boots easy to get in and out of and being able to change out outsoles with the OmniTrax choices gives you a ton of options. The Devil's Canyon wading boots have been my go to for a couple of years now and they continue to be comfortable, lightweight for travel, and holding up great after many trips and miles on the water. I always tend to carry way too many fly rods on trips and this one was no exception. Each day though I spent time with a different fly rod and had a great time matching conditions to the strongest abilities of each fly rod. What started out as a limited edition run of ten fly rods has come back as a permanent addition to the line up. This E-glass 7'5" 4/5 weight is parabolic in taper and just super fun to cast. Chris Barclay is doing some very special tapers in the parabolic series and continues to blow my mind with his offerings. I carried along the 7' 3/4 weight fly rod on this trip and this first glimpse into the new Sirrus line up is positive with a taper that deep flexing and enjoyable to cast with dry flies. It turned over small hoppers with ease and accuracy. Four fly rods will be offered in the Sirrus series from two weight to five weight with classic aesthetics. This series will be a lot of value for the money. 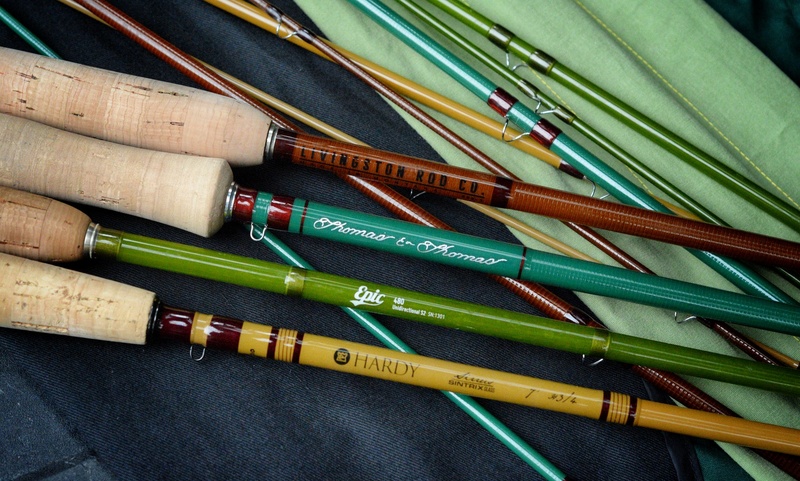 Dusty Smith of Livingston Rod Company looked to set himself apart from other rod shops and his initial glass offering was the "Western Glass Series" with tapers designed specifically to excel doing things like hopper/dropper and indicator nymphing on western waters. Though I refused to go double nymph on our day on the Bighorn River, this 8'6" five weight fly rod was a joy to fish with double hoppers and hopper/dropper rigs. Progressive "do all" taper that can definitely get the work done. I have a short list of favorite four weights and the Epic 480 remains at the top duking it with a couple other contenders. I continue to be impressed with this four weight and I can't tell you how many guides that I've fished with over the past couple of years that pick it up and are astounded that this is fiberglass and that it's so damn good. This taper is on the slower end of spectrum as far as Epic tapers go but it's oh so sweet. The Lotic 7'10" five weight prototype arrived right before leaving for the trip with a note that the taper was finalized but that the aesthetics would be a departure from the Heirloom series green with burgundy wraps. The Lotic is an interesting departure from the Heirloom series of fly rods with a crisper action but still maintains a very fiberglass feel. Not only is Swift Fly Fishing killing it with a growing list of excellent of fiberglass (some carbon too) offerings, earlier this year they released double taper and weight forward fly lines designed to be true to line weight and excel when presentation is important. 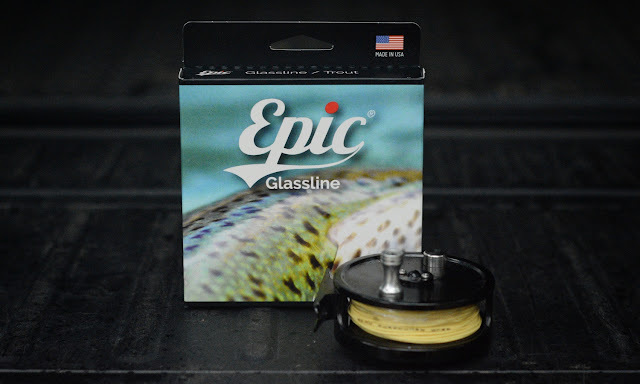 The Epic Glassline fly lines are made by Scientific Anglers and include their AST technology, printed line designation near the tip, and tapers that match the Epic fly rods perfectly. Give one of these a try if you're looking for a fly line for your Epic. 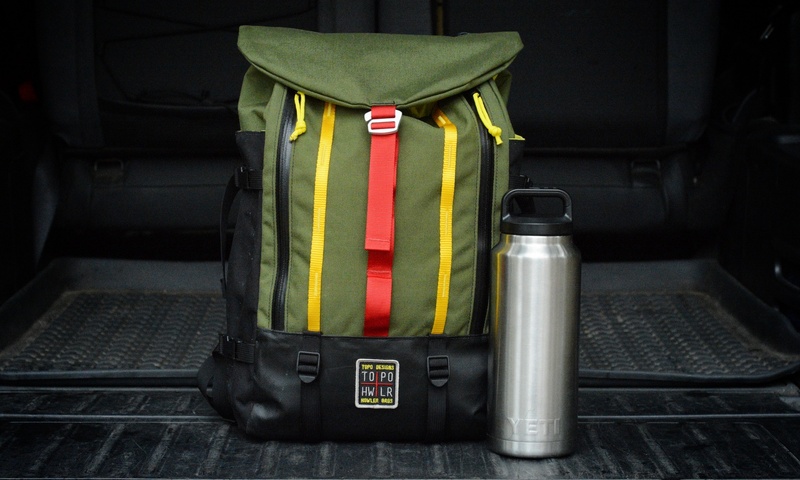 Right before leaving on this trip the new collaboration between Topo Designs and Howler Brothers went live and I took the Mountain Pack along as a carry on and then fly fishing pack to wear during the trip. The Mountain Pack hits all the sweet spots for being a perfect size, comfortable to wear all day, well thought out spaces for water bottles or rod tube on the exterior side pockets, zip access to the main compartment from the front, large zip pocket on the front and lid, and more than enough lash points, webbing and D-rings for all and any fly fishing accessory or other add ons. Oh yeah, and it looks damn good too. 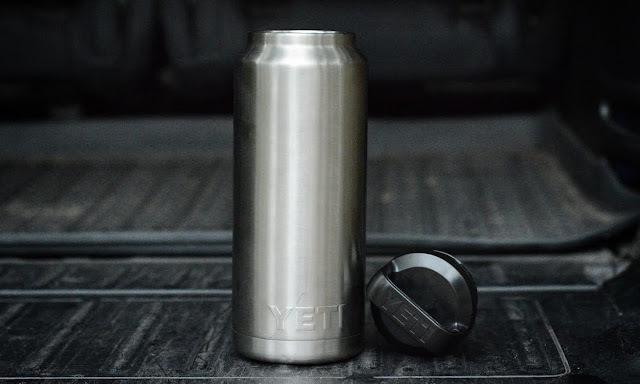 The Rambler series continues to grow and the 36 ounce stainless steel insulated bottle is a favorite to carry along daily to work and when fly fishing as well. I've been surprised more than once to pick this bottle days after a trip and it still has ice in it. Freaking amazing. I've used the Dry Shake Powder for years but that is going to take second place to the new Shimazaki Dry Shake Liquid as it is so easy to use by dipping flies in and out for a quick flick to get rid of any extra. The shake liquid permeates the fibers and materials in the fly keeping them riding high and dry. 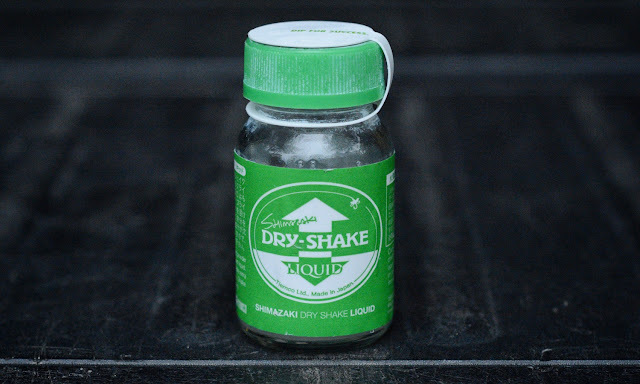 Also available in Dry Shake Spray too but guide friends that use it, swear by the Dry Shake Liquid. The Fly Trap XSM was just mentioned in the Holiday Guide Guide but deserves another nod in this post as it was perfect for keeping a mess of hopper patterns at the ready while keeping four spools of tippet handy as well. 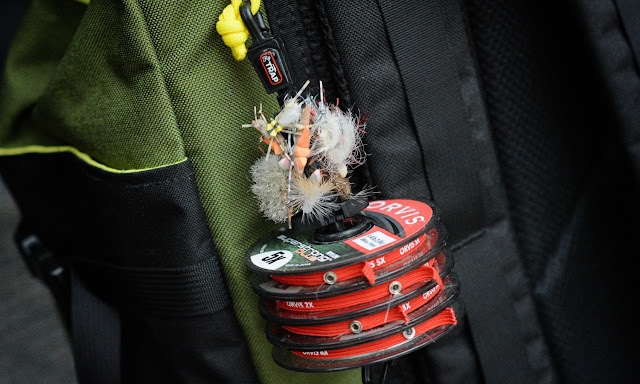 The Fly Trap remained clipped to a D-ring on the front of the pack and was there but never in the way. There are several models in the Fly Trap series allowing for more or less space for flies or tippet spools to match your needs. This is a new company to keep an eye on in the coming year. On my last conversation that I had with Greg Senyo, (who's been hosting a trip to this area for years) he said "Oh yeah, bring a cooler if you can fit it in." 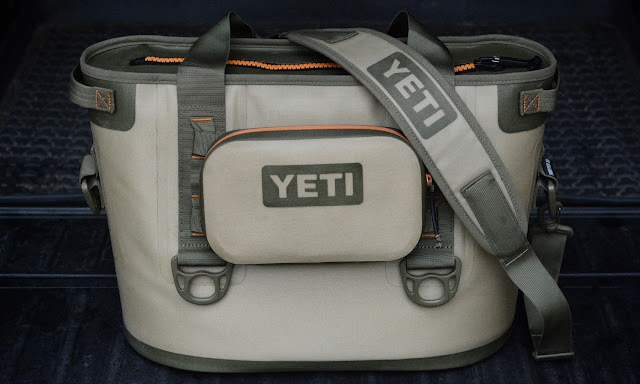 I still had some space in the large duffel bag that I was checking and squeezed in my YETI Hopper 20. As soon as I arrived in Cody, I stopped at the store for a bag of ice, water, and brews and it stayed full of cold drinks throughout the trip. There are four sizes now in the Hopper series and the Hopper Flip 12 and Hopper 20 are my personal favorites. Toss a four pound YETI ICE in the bottom of the Hopper, fill with drinks and a few pounds of ice, and you're set for several days of cold. The Hopper 20 is easy to carry with the wide padded nylon strap and enough space for drinks and lunch for a day on the water. Believe me, there's always a place in the boat or back of the truck to toss it in for the day. There are few places that I go anymore without a cooler and I typically grab a Hopper. Next up, the Blue Horizon Belize gear round up which I hope to knock out before the end of the year.